Easy Low-Carb Pumpkin Custard - Low-Carb, So Simple! | Low-Carb, So Simple! 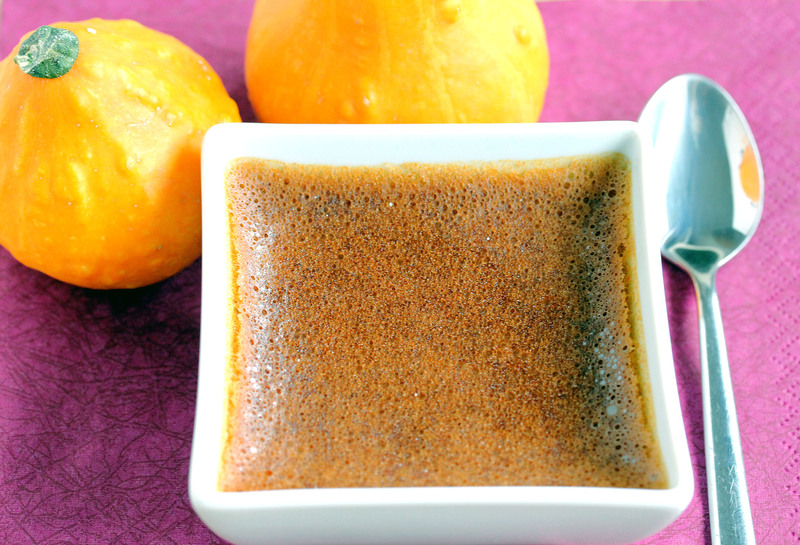 In a large bowl, mix quickly the pumpkin, erythritol and the pumpkin pie spice with an electric mixer. Add the eggs and mix quickly. Add the heavy cream and mix until well mixed and there are no lumps in the mixture. Pour the mixture into ramekins or other small ceramic forms. Place the ramekins in a large roasting pan and put in the oven. Pour boiling water into the pan so that the water is halfway up the sides of the ramekins. Bake for some 45 minutes, until the custards are almost firm. You can check the firmness by gently shaking the pan. If the custards are firm, they stay still, or the center will only slightly shake like jelly. If the custards are not ready, the whole top will shake like jelly. Be careful not to shake too hard, the hot water in the pan spills and burns easily! A safer way is to insert a stick or a knife into the center of a ramekin. If it comes out clean, the custards are ready. The custards will solidify more when they are chilled, so in this stage they don’t have to be completely firm. Place the ramekins on a cooling rack. When they have cooled down to room temperature, refrigerate them for several hours, or preferably overnight. You can use canned pumpkin or self-roasted. Just make sure that the canned pumpkin is 100% pumpkin without any added sugar or spices. 3 eggs make thick and rich custard. If you prefer your custard a bit more fluid, you can use 2 eggs instead. It’s good to mix the custard mixture along the bottom while pouring it into the ramekins. The erythritol tends to sink sometimes to the bottom, and with mixing we ensure that all the servings get an equal amount of erythritol. If you beat the custard mixture a couple of minutes, it will form small bubbles. These small bubbles form a thin, lacy crust in the ready custards. The crust is not very hard or crispy, just a bit harder than the custard itself. If you prefer crispier crust, please see the sub-chapter “Tips for variation”. 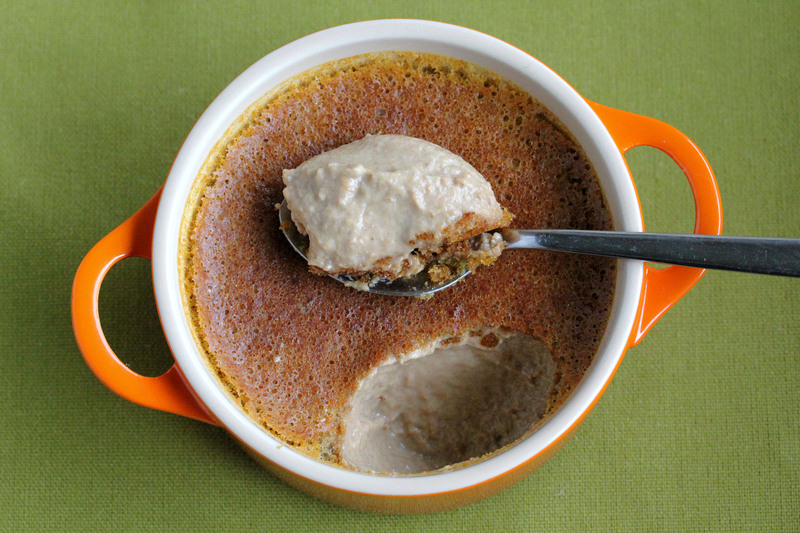 I made my first low-carb pumpkin custard experiments few years ago. I used self-roasted pumpkin and heated and chilled the mixture of cream, sweetener and spices before baking. I found the procedure a bit too complicated, so I tried how it works if I just mix everything together and bake the custards without any preheating. It worked equally well, so I’ve used my simplified method ever since. In my next experiments I adjusted the amount of eggs. 1½ cup (360 ml) heavy cream was clear from the very beginning, but how many eggs do you need to get the perfect consistency? Not too fluid, not too dense. And I wanted to use whole eggs, not just yolks, like often in pumpkin custard recipes. I found out that 3 eggs is the ideal amount here, at least to my liking. I prefer quite thick, rich custard. The amount of sweetener needed also a bit adjusting. 1/3 cup (80 ml) erythritol was a bit too little, 1/3 cup + 2 tablespoons (110 ml) was a bit too much to my taste. 6 tablespoons was just great for my sweet tooth. However, since the preferred sweetness is quite an individual thing, please feel free to adjust the sweetness to your liking. If you prefer a crispier crust — and if your carb quota allows — you can sprinkle ½-1 teaspoon brown sugar or brown sugar substitute evenly on top of each serving just before serving, and broil the custards in a broiler or caramelize the top with a kitchen torch. Follow carefully the manufacturer’s instructions, and don’t heat too long, just until that the brown sugar or the brown sugar substitute begins to caramelize. Usually this happens in few seconds. Naturally the brown sugar makes better crust than the brown sugar substitute. Count the extra carbs from the brown sugar or the brown sugar substitute, if needed. If you think heavy cream alone is too rich, you can use half heavy cream, half milk to get even more velvety consistency. Milk has slightly more carbs than cream, though. Your preferred spice mix containing for example cinnamon, ginger, nutmeg, cloves, lemon peel, orange peel or fenugreek. Heat the cream and erythritol with a bag of caffeine-free rooibos chai tea so that the mixture is hot but not boiling. Stir the mixture once in a while. Be careful not to break the tea bag while stirring the cream. However, if the tea bag breaks, don’t panic, just leave the bag there and strain or filter the mixture when it’s time to remove the tea bag. Chill the mixture in the fridge for a half an hour. Omit the tea bag from the chilled cream mixture. Add the eggs and pumpkin to the mixture and beat until well mixed. An electric mixer works best. 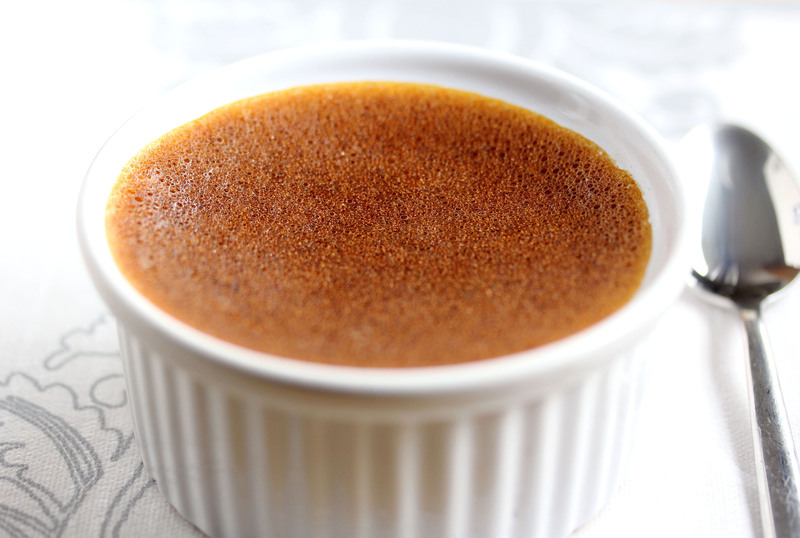 Follow the instructions in the beginning of this post for baking the custards. NB. The tea bag gives the all needed spices, there is no need to add other spices unless you want to experiment. Sprinkling brown sugar substitute on top. 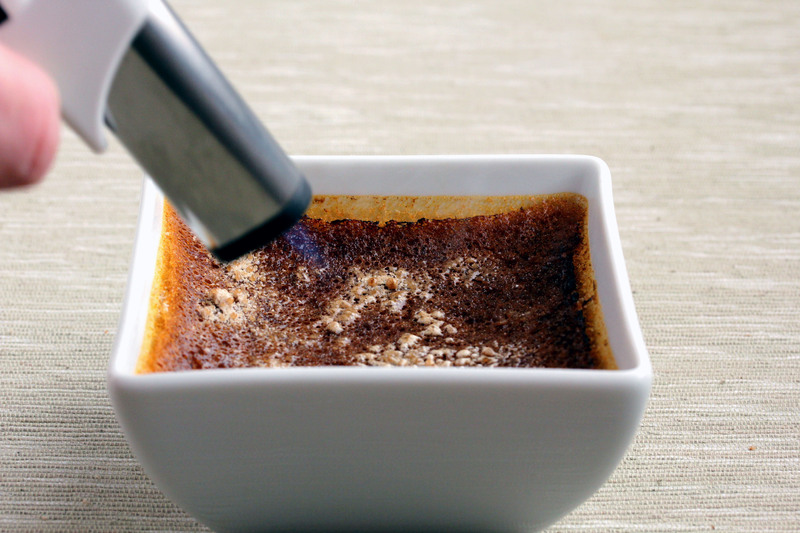 Using a kitchen torch to caramelize the brown sugar substitute.